Check out a panorama of the King Edward Motel kitchenette unit. Come visit Stewart, BC, Canada and its neighbor, Hyder, AK - the friendliest ghost town in Alaska. From the prospecting history to the amazing World Class grizzly bear viewing - Stewart, BC and Hyder, AK have it all. The King Edward Hotel and Motel - conveniently located on the main street of our picturesque town, Stewart, BC. We're a full service facility that includes a cozy family style café, Casey's Pub, the Kings Table Dining Room and The Prospectors Meeting Room, thirty hotel rooms and twenty motel units with kitchenettes and drive up comfort. All our rooms have private bath, air conditioning, cable TV, direct dial telephones and much more. Non-smoking and pet friendly rooms are available. There are many flags flown at the King Edward Hotel and Motel representing the wide range of visitors to our town. Visitors can't help but to be in awe of our incredible scenery...the grizzly bears, the soaring eagles, the glaciers and mountain peaks. In fact, you may even have to stop your vehicle to allow some local wildlife to cross the road. Come and enjoy great northern hospitality in our friendly, small town. 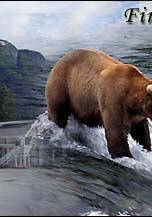 Spend your days viewing the Salmon Glacier and your evenings at the World Famous Grizzly Bear viewing station. You could be less than fifty feet from a grizzly dining on the spawning salmon at Fish Creek - where it is not uncommon to see a mother grizzly teaching her young cub to fish. 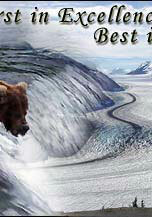 Make sure you don't rush your stay, the fresh mountain air, glaciers, bears and hospitality are addicting! You are guaranteed to remember your visit to one of northern British Columbia's examples of pristine nature and wilderness at its best!